Who should I buy a pup from? I think my obsession with horses began the day I was born - I blame my mother for giving birth to me opposite a racecourse! My father taught me to ride at the age of 10 & we spent many a weekend at the riding school, "Yarramalong", with my dad on "Noddy" & me on "Dancer". I borrowed a pony or two for the local shows & I soon got the competitive streak. Thoroughbreds & Riding Ponies took my fancy early in life & one pony led to another until i purchased "Sophies Choice Of Astral". Sophie is a sweet Riding Pony mare by Strinesdale Matadore (UK) out of Chippenham Acorn. Sophie has gained Championships at both State & Royal levels & has recently produced the stunning colt, "Gold Label Of Huntingdale" (aka Remington) by "Kolbeach Royalist". Although only lightly shown, due to showing my dogs & lack of time, Remi has done very well & I look forward to showing him under saddle in the future. He has since been gelded as a 2 year old & now a 3 year old, is currently being educated by myself & Melissa Karutz. Another pony I bred, "Blackberry Nip Of Huntingdale" is making herself known under saddle & has recently placed 2nd at Barastoc with her new owner. My husband Clive, loves the excitement & bling of the colour world. He wanted a Paint & so i kept a look out for something that took my eye. 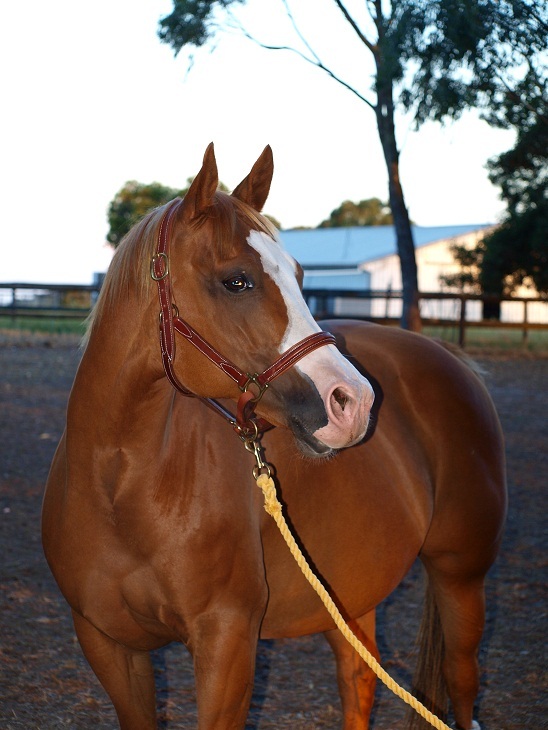 We purchased a yearling gelding named "Awe Shucks" from Jim & Helen Mclean, QLD. Shucks was bred by Kath Peterson of Coronation Park Stud. His sire, "The Awestriker" (Imp USA) & his dam, "Shimmer N Shine" need no introduction to the Paint show world. Our first show with Shucks was the S.A State Paint Show in 2007 in which he won everything he was entered. We then headed up to the Nationals for the experience & again Shucks did us proud by winning both the Amateur Owner class & the 2yo & Under Open class against some very professional competitors! We were so impressed with Shucks that we purchased his dam, Shimmer N Shine & repeated that mating. Oct 2009 Shimmer gave birth to the lovely colt, "Just Awesome" (aka Montana) & a kinder gentleman would be hard to find. In March 2010 we decided to try our hand again at our State Show with the 2 boys & once again Awe Shucks gained CHAMPIONSHIP in every class he had entered. "JUST AWESOME" is following closely in his big brothers footsteps with 1sts, 2nds & 3rds in all his classes at the State Show & we're off to Tamworth for another National experience Easter 2010! to Holly Ewins of "Holly Ewins Photography"
Dam of "Awe Shucks" & "Just Awesome"
"ENCORE OF HUNTINGDALE aka "Corey"
Placed Runner-Up Newcomer large pony hunter 2012 at his FIRST outing under saddle !!! Copyright ©2010. Amstafomine All rights reserved. It is expressly forbidden to use any material without the copyright holders written permission. Website built and designed by D. Hughes, Amstafomine.